Golden Witch – Bamboo Rod Restoration Handbook – SIGNED! Home	/ Education	/ Books & Catalogs	/ Bamboo Rod Restoration Handbook – SIGNED! Thus begins our 20th Anniversary Sale. This is the first item we’re listing! These were $74.95, but now they’re down to only $64.95. Grab a copy! To read a bit more about our 20th Anniversary Sale, please read our “About GW” page. Before long, we’ll add a whole new category page to bundle all the 20th Anniversary Sale items. 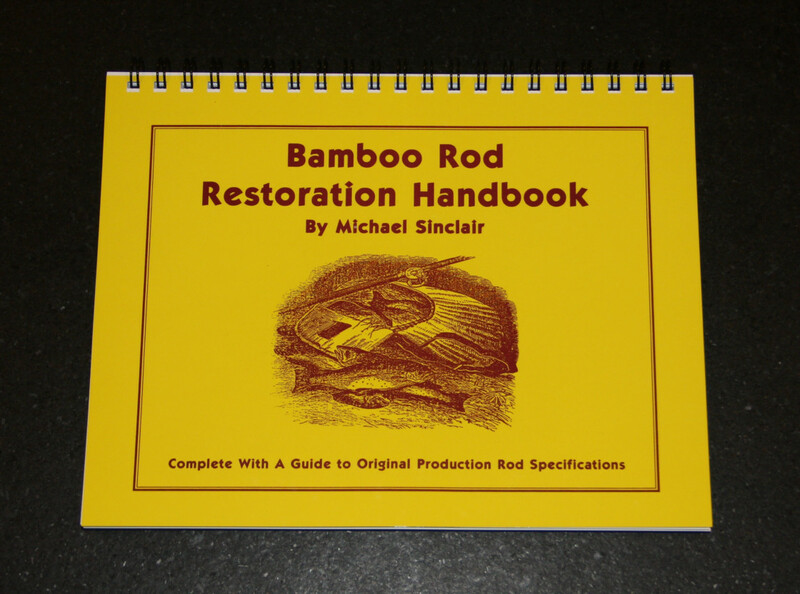 This book, Michael Sinclair’s Bamboo Rod Restoration Handbook, is the bible for rod restorationists. In the GW shop, our dog-eared copy is most often opened to the silk “Thread Color Charts” which start on page 62. Michael’s work is a treasure, so don’t miss this opportunity to score an inscribed copy. We ordered a short stack of these books from Michael in preparation for our Big Bamboo & Glass Bash, and he inked each copy, appropriately, “The Big Bamboo & Glass Bash 2017” and he signed each copy. Sadly, the bash never materialized because the state of Pennsylvania ‘borrowed’ our field when they decided to replace the adjacent bridge on Route 322. A year later and the bridge is still under construction. Originally our plan was to use these books as door prizes, and to give an inked copy to each of our presenters as a Thank You gift. Since the bash crashed, we’re sitting on a stack of oddly inked books. Signed, mint-condition, copies of Michael’s Bamboo Rod Restoration Handbook are typically rare as hen’s teeth, and just as pricey. We’re offering the first dozen copies for only $64.95. Once they sell, we’ll sell the rest at market price. Grab them while you can. The photos show one example copy. Each book is hand inscribed. Michael was exceptionally neat with his inking, but he was not a machine, so expect your copy to vary slightly from the pictures. If you’re ordering this from outside the US, please DO NOT choose the small flat rate box as this book won’t fit. Email us and we can arrange payment for the book and appropriate shipping through PayPal.